It was one of the first festivals I “stumbed” upon when I moved to Morocco back in 2011. 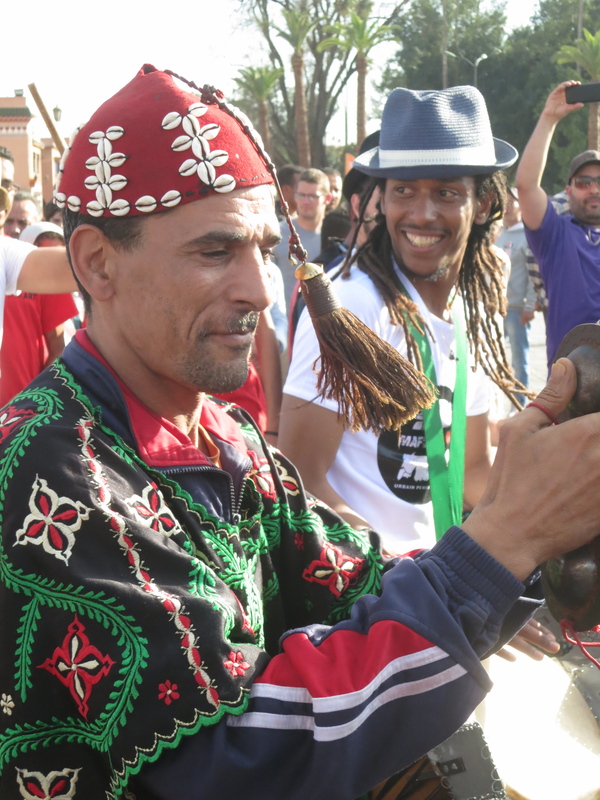 Street performers, musicians and marionettes shut down Marrakech’s busy Avenue Mohamed V as they danced and paraded through the streets to launch Awaln’Art, a festival that features international artists performing in public places. Since then I’ve stumbled upon and looked forward to the consecutive editions. What I love about the festival is that all performances seem spontaneous, yet engage the local audiences. As the international artists take to the streets, expect the unexpected. Tonight Mafia Urbain kicked off the four-day long festival in Marrakech with drumming through Jemaa el Fna, engaging the locals along the way, including some of the regular performers in the famous square. Incognito, contemporary dance in the Marrakech Plaza (where Zara and McDonald’s are located) at 6 p.m.
Heures seculaires, circus performance at 11 a.m. and 5 p.m. Le Braquemard #1, circus in the magical setting of Agafay Desert at Terres des etoiles. Starts at 5 p.m. and sounds fabulous! Programmes are available around town and more information is available at awalnart.com.